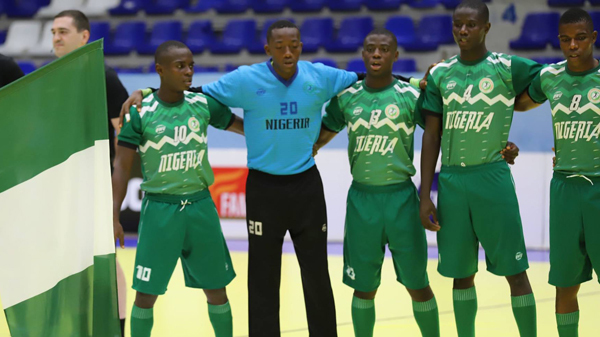 After arriving in Kosovo on the morning of their opening match, against Chinese Taipei, Emeka Joseph Nnamani’s Nigeria youth side were given a tough handball lesson by the Asian island nation, behind by 10 at the half-time break before eventually losing 36:18. And with their next, and crucial, match against Paraguay to come just over 16 hours after they had left the court in their opening day loss, they had to regroup quickly to ensure progression through to the semi-finals in the do-or-die clash. But Nigeria prevailed and nearly reversed their opening day loss exactly, winning 31:18, leading by 18:7 at the break to ensure a semi-final spot against group B winners Canada on Saturday (13 April). Like any IHF Trophy Intercontinental Phase, especially at the youth level, it is the first time that players have faced teams from outside their own continents, and for the Lagos centre-back it is something he relishes. “It was something different playing against Paraguay as it was the first time we played South American counterparts,” said the diminutive player, who stands at 1,60m. “These games give us more experience as we continue to play different opponents. For the 19-year-old centre back, representing his country is a real privilege and honour. He started playing the game in 2009 through his school and through the support and encouragement of his father who was a coach with the Nigeria men’s national team as well as club teams in the west African nation. Now 10 years on from the start of his handball career he is progressing well but wants to keep pushing and aiming higher with the sport he loves. “It’s my first time in Europe and it’s very nice to be here as I usually watch most of it on television,” he said. “Over here it’s very different with playing indoors and the atmosphere – it’s really nice to come here to play handball. Proudly leading his team out onto court in the Kosovan capital, Dikko enthuses about his pride in wearing the green and white shirt of his nation, a newly-designed, vibrant addition to the courts in Kosovo but is quick to stress that the focus is on getting the win. “It is a real honour to put on the Nigeria shirt,” said Dikko, who has scored 10 goals in his two matches so far. “Putting on this new shirt – we are the first people wearing it and are all very happy. We feel really nice wearing it and we all want to thank our president and the board who are really making an effort to make Nigeria a great team in the sport.